Founded in 1945, Lista is a leading manufacturer of various metal products. The company started out with the production of modular storage systems, and today, it provides customized workspace solutions that help its clients create the perfect workspace. Since its inception, Lista’s products are recognized for their good looks, quality, configurability, and configurability. Their intense focus on details is second to none and that’s why they have achieved exceptional levels of manufacturing, aesthetic, and design excellence. Currently, the most popular products from the Lista brand include high quality cabinets and workstations. You can rest assured that their comprehensive line of technical furniture, worktables, workbenches, and workstations provide superior productivity, flexibility, and durability for your unique workspace. 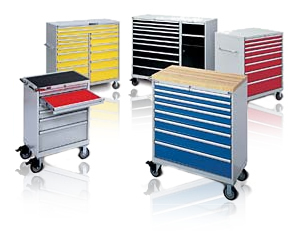 At Willrich Precision, we carry the latest range of Lista workplace and storage solutions. Whether you are working in the aerospace or agricultural industries, we can help! You can rest assured that the Lista products we carry bear the iconic, official LISTA trademark, which signifies durability and quality in markets worldwide. Our company has been in the business for nearly five decades and we continually strive to serve our clients reliably and faithfully. When you buy your Lista products from our company, we ensure that you get good value for money. By shopping at our online store, you will quickly discover that our competitive prices are hard to beat. Start browsing through our inventory today and source for Lista cabinets and workstations with exceptional ease!